That’s how I feel about the last 24 hours – after all the excitement, all the buildup and all the anticipation India won the Cricket World Cup right here at home in Mumbai. The city exploded. Fans flooded into the streets. Cheers could be heard until the morning. Bollywood’s biggest star, Shahrukh Khan came out in his car and Bandra was suddenly an excitable mob scene. The next day, we happened to walk into the Taj Hotel for tea and lo and behold – the entire cricket team was leaving. 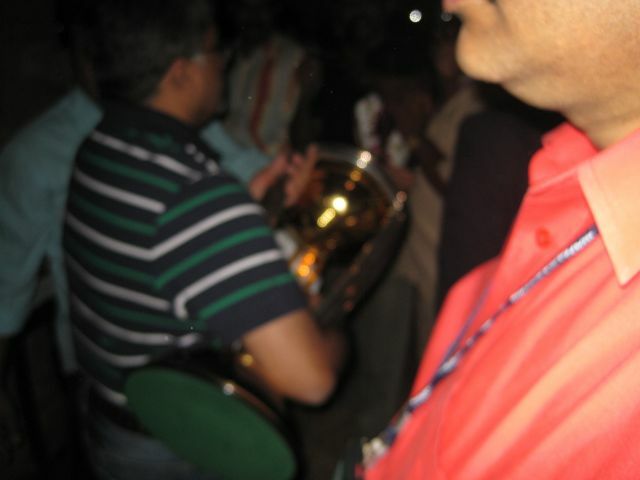 It was pure chaos – fans shrieked and shouted and pushed and shoved just for a chance to touch their team and their god, Sachin Tendulkar, holding the cricket world cup. And we got it all on video. Incredible. This reminds me of when we were in Milan when Italy won the World Cup in soccer in the early ’80’s. Instead of banging pots we had firecrackers exploding everywhere! Thanks for sharing the excitement! I’m enjoying every blog.